Thursday's keynote at the Austin Game Developers Conference was given by Frank Pearce and J. Allen Brack. Pearce is the Executive Vice President of Blizzard, and Brack is the Production Director. Both are heavily involved in WoW and are part of the team responsible for its success. Unlike the keynote/opening ceremony delivered at BlizzCon, the Austin GDC keynote is geared more towards game developers and industry people than the general game public. For us WoW folks this means a little more details and numbers than you'd see from panels elsewhere. In fact, one of the most interesting numbers that came out of the keynote today are the sizes of the teams that are working on various parts of WoW. After the break we'll look at those and other highlights from the keynote, as well as provide you with an audio recording of the entire thing for your perusal if you wish. Download the audio or stream it after the break. It should be noted that some of these numbers overlap with each other. For instance, there are some international GMs. One of the more interesting things for us is to see how the design side of things are laid out. As shown in the above slide, you can clearly see where everyone in the team stands. 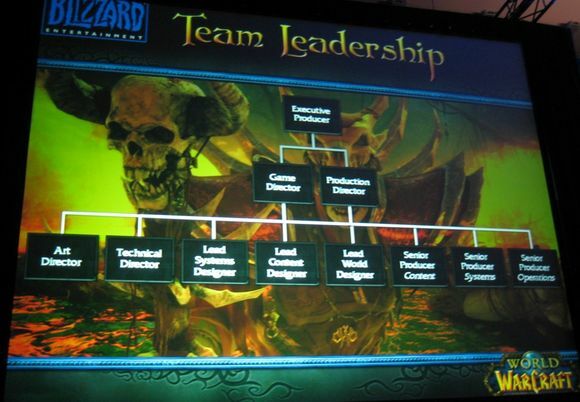 For instance, the often quoted Lead Systems Designer Greg Street (Ghostcrawler), reports to the Game Director and Production director, who in turn report up to the Executive Producer of WoW. Of particular note in the design department, which is game design – things like classes and items, not art – is that there are only 37 people working there. 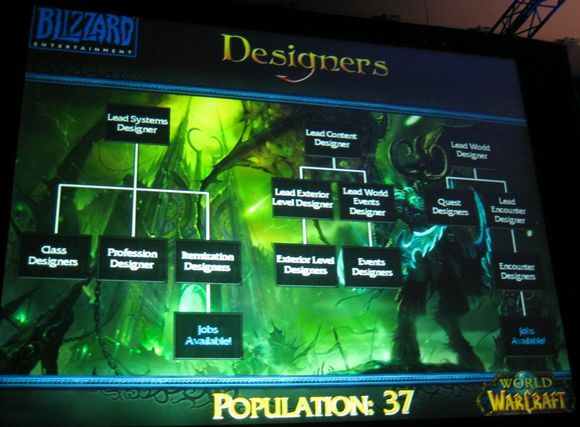 Those 37 people are responsible for the majority of what happens in WoW. Everything from the class balance, to the world events, to the levels, to the dungeons. In some ways I'm surprised that it's only 37 people working on those elements of the game, but in some ways I'm not – from my understanding in talking with Blizzard folks over the years is that the teams are incredibly tight knit and work very closely and well with each other. 37 people, when tasked correctly, can cover a lot of ground for the nearly 12 million of us playing the game. One of the least understood yet most important aspects of WoW is the patching deployment that goes on during large events like Patch 3.1. The size of it can be astounding. According to data presented at the keynote, Patch 3.1 delivered more than 4.7 Petabytes of data. That's 4,700 terabytes, or 4,700,000 gigabytes. For comparison, Facebook has around 1.5 Petabytes of data, AT&T had 16 Petabytes transferred through their network each day in 2008, and according to a New York Time article the entire written works of human kind would amount to about 50 Petabytes of data. When WoW deploys a patch, it's mind boggling huge. There are 180,000 bugs being tracked by Blizzard for WoW. These bugs can be in various statuses from resolved, being resolved and unresolved. You can read more about this from our announcement.